Select to start a New Presentation. 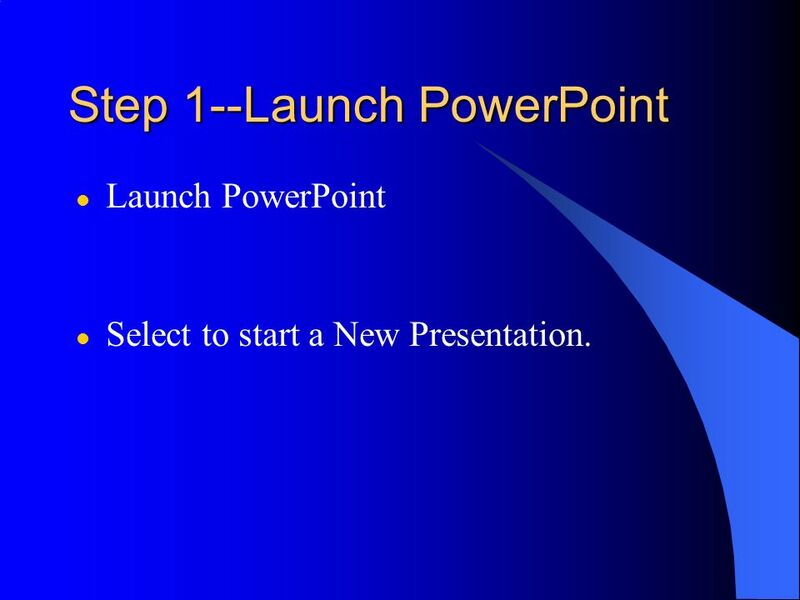 When you launch PowerPoint, the first slide you see is a Title Slide. 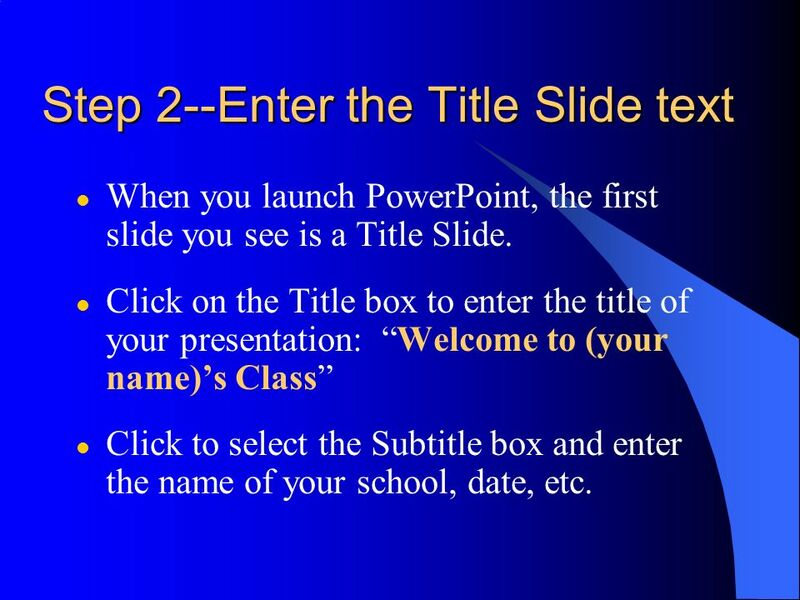 Click on the Title box to enter the title of your presentation: “Welcome to (your name)’s Class” Click to select the Subtitle box and enter the name of your school, date, etc. 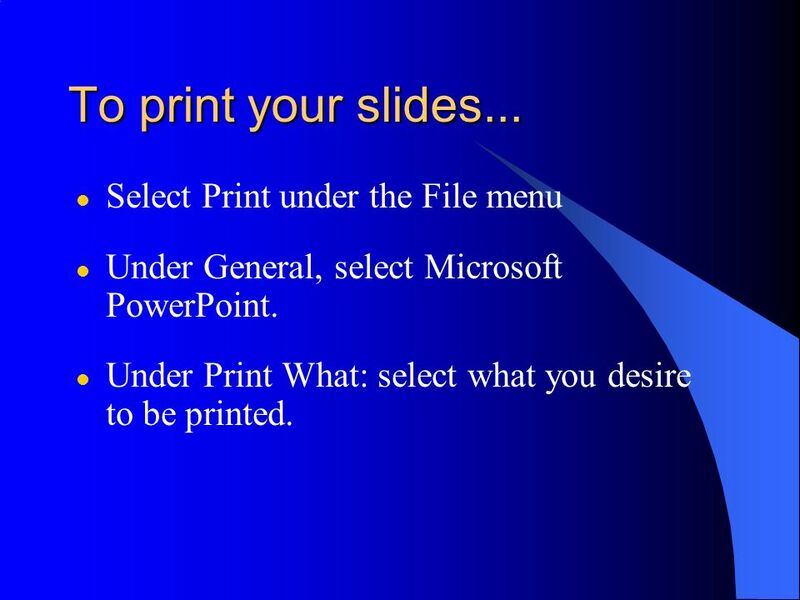 Under Insert, select New Slide You will be presented with a Bulleted List layout screen. 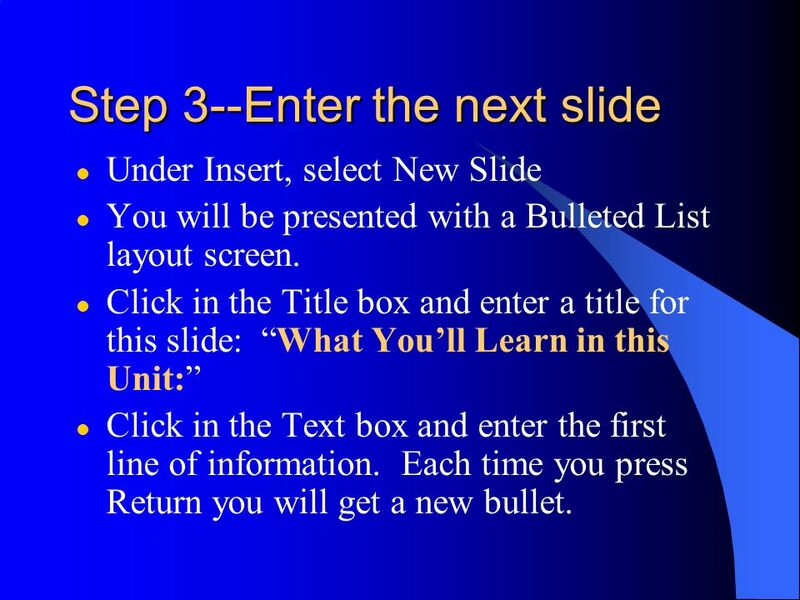 Click in the Title box and enter a title for this slide: “What You’ll Learn in this Unit:” Click in the Text box and enter the first line of information. Each time you press Return you will get a new bullet. 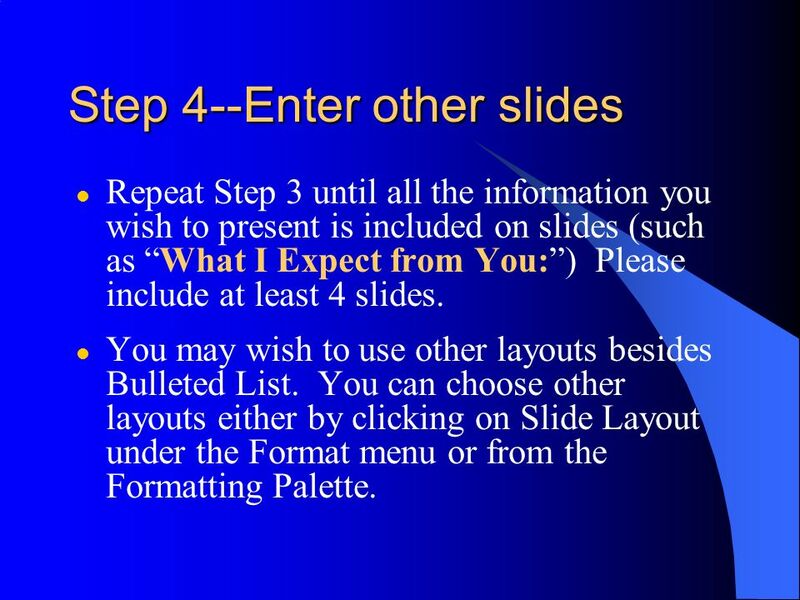 Repeat Step 3 until all the information you wish to present is included on slides (such as “What I Expect from You:”) Please include at least 4 slides. You may wish to use other layouts besides Bulleted List. You can choose other layouts either by clicking on Slide Layout under the Format menu or from the Formatting Palette. 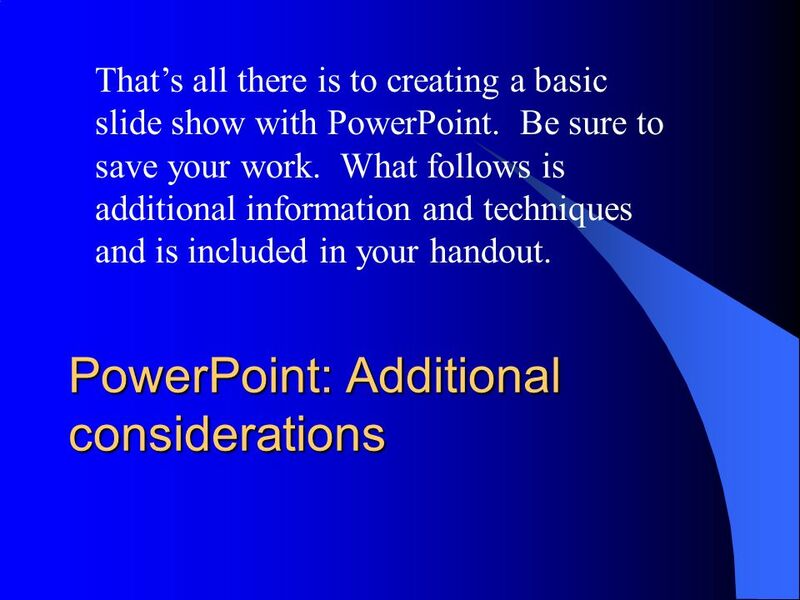 To start your slide show, select View Show under the Slide Show menu or click on this icon in the lower left corner of your screen: To advance from one slide to another use the arrow keys or the mouse. 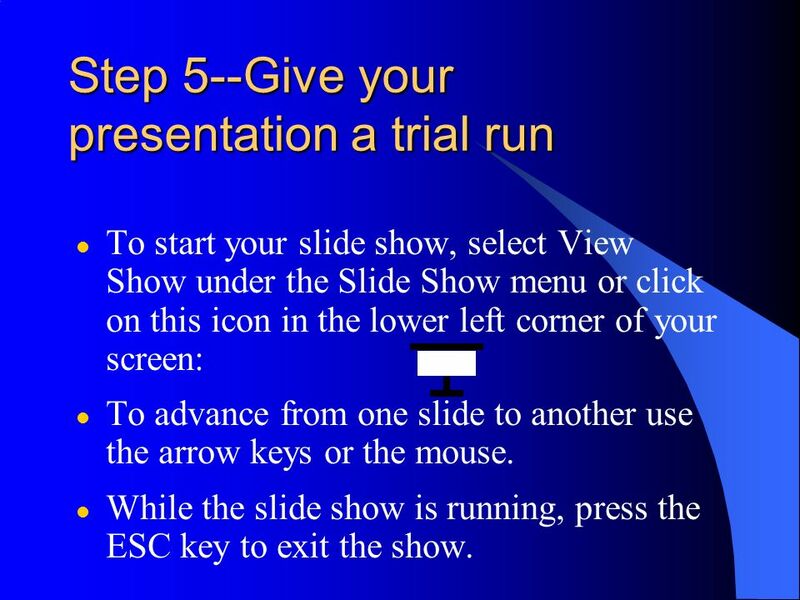 While the slide show is running, press the ESC key to exit the show. 9 Step 6--Save your work so far. Select Save under the File menu and name your file. Save it to your Documents folder. 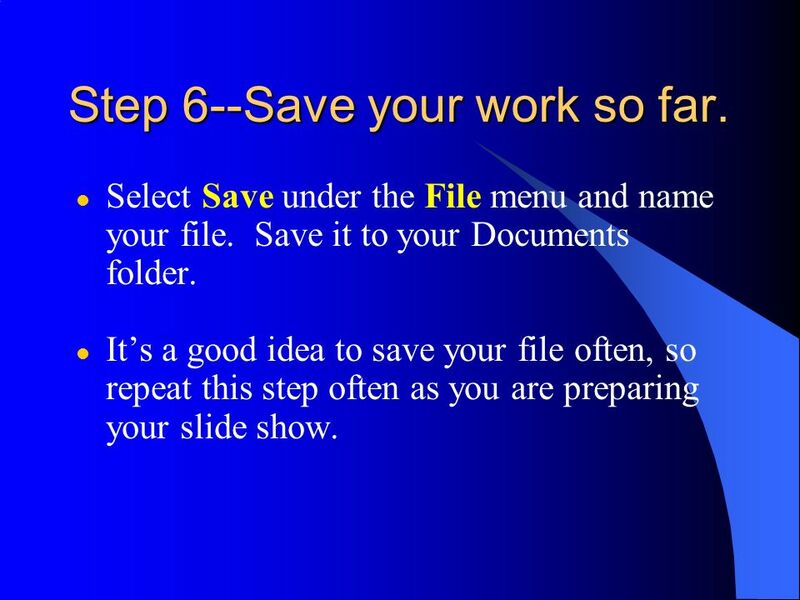 It’s a good idea to save your file often, so repeat this step often as you are preparing your slide show. 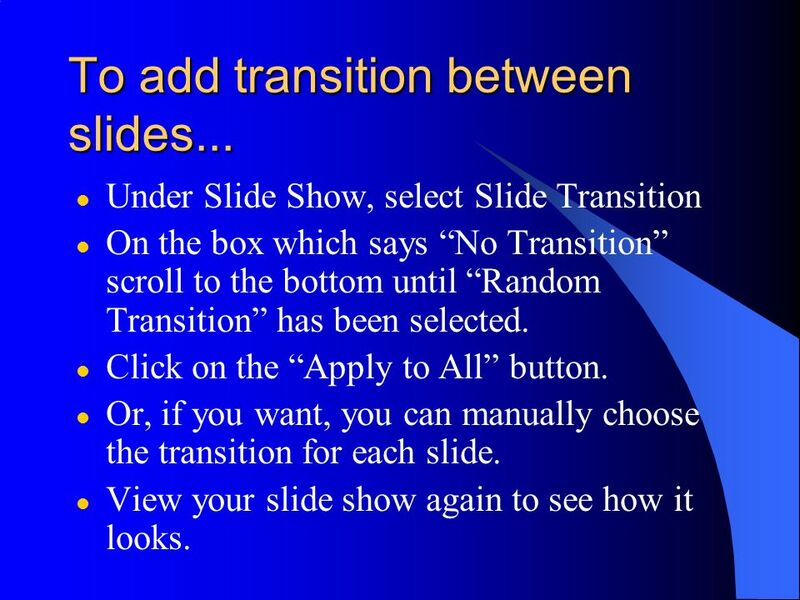 Under Slide Show, select Slide Transition On the box which says “No Transition” scroll to the bottom until “Random Transition” has been selected. Click on the “Apply to All” button. 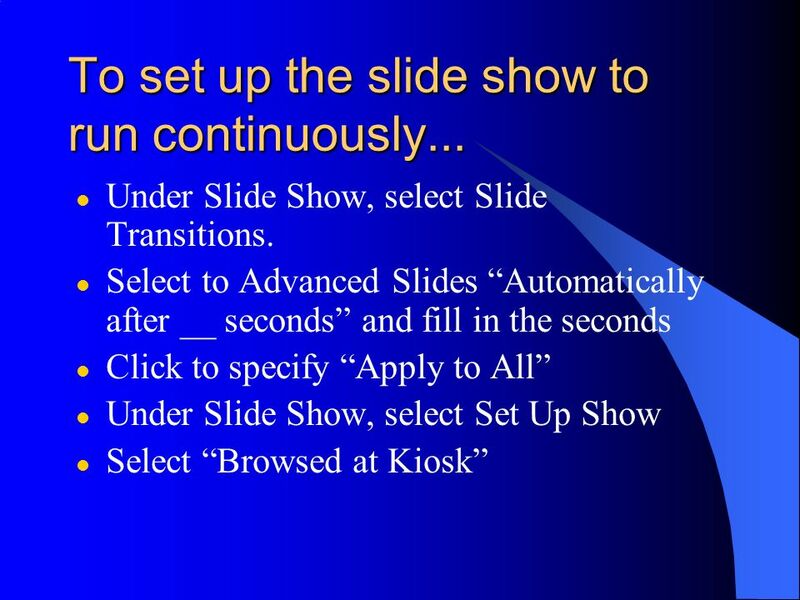 Or, if you want, you can manually choose the transition for each slide. View your slide show again to see how it looks. Click on the text box which contains the bulleted items you wish to be animated. 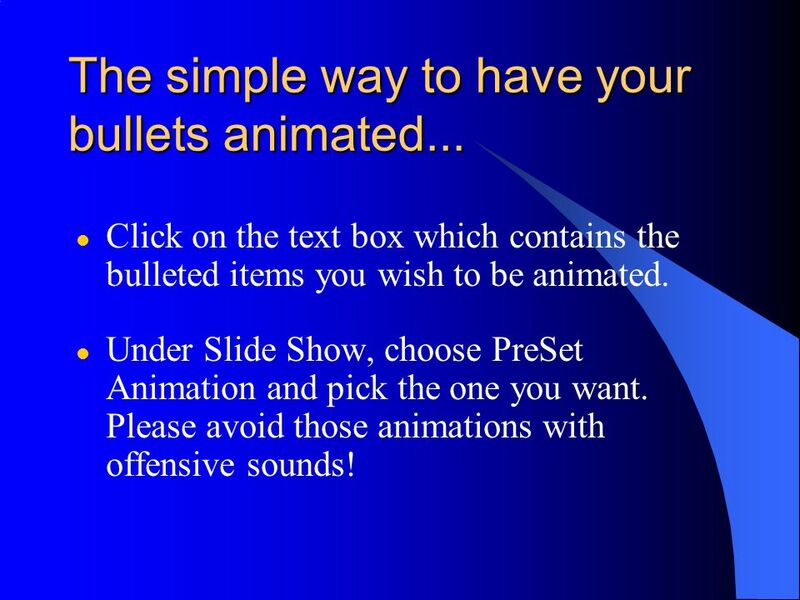 Under Slide Show, choose PreSet Animation and pick the one you want. Please avoid those animations with offensive sounds! 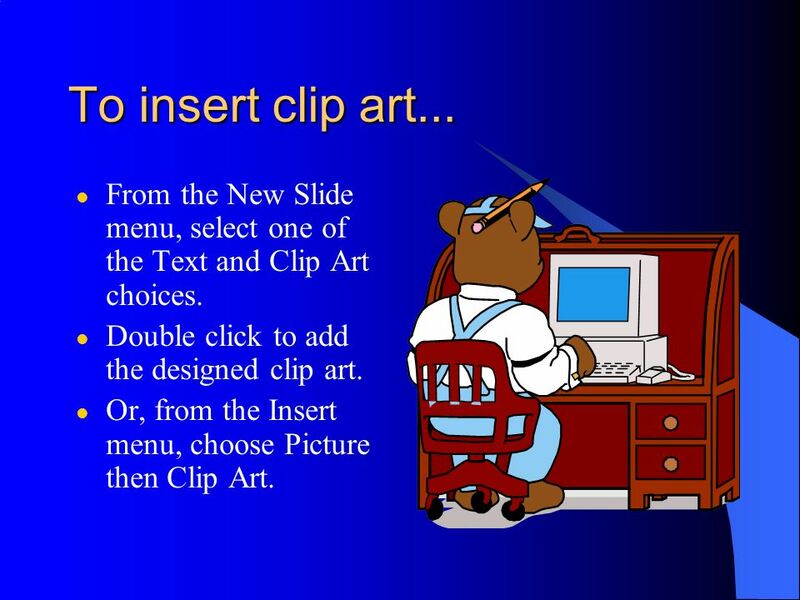 15 To insert clip art... From the New Slide menu, select one of the Text and Clip Art choices. Double click to add the designed clip art. 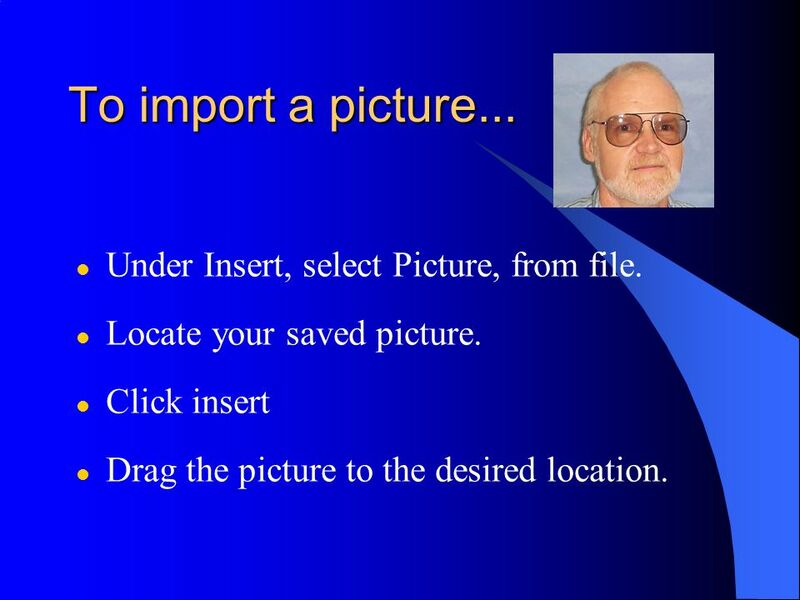 Or, from the Insert menu, choose Picture then Clip Art. 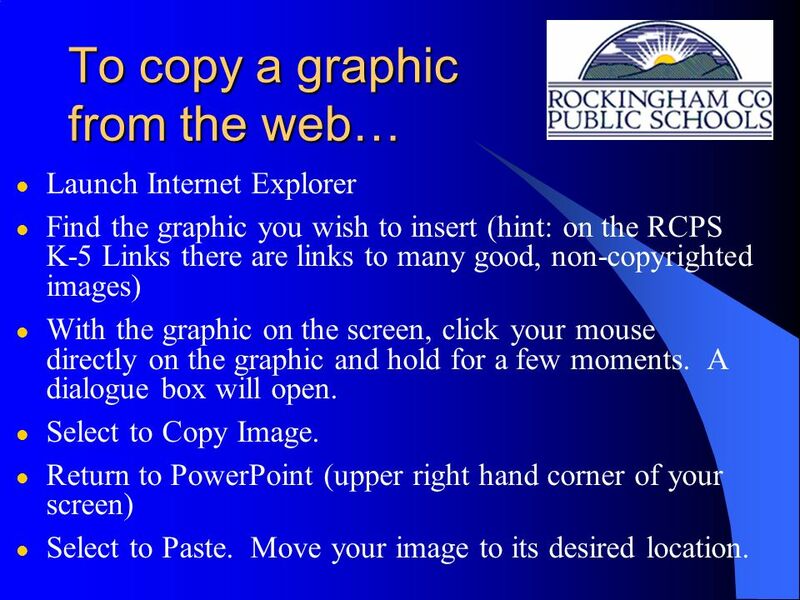 Launch Internet Explorer Find the graphic you wish to insert (hint: on the RCPS K-5 Links there are links to many good, non-copyrighted images) With the graphic on the screen, click your mouse directly on the graphic and hold for a few moments. A dialogue box will open. Select to Copy Image. Return to PowerPoint (upper right hand corner of your screen) Select to Paste. Move your image to its desired location. 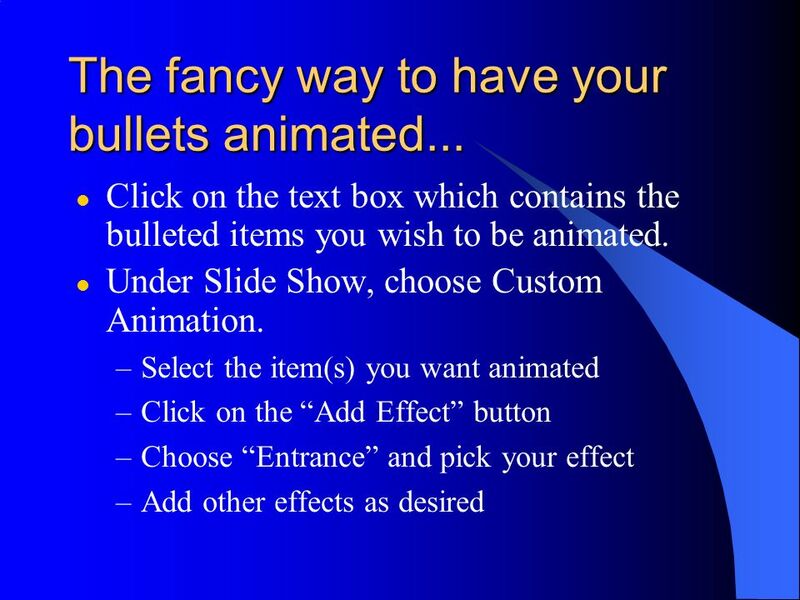 Under Slide Show, choose Action Buttons Select a button, such as the Home button Place it on your slide by creating a box by dragging Choose the action you desire from the resulting window Note: you can change the color of the button by clicking on it once you’re created it. 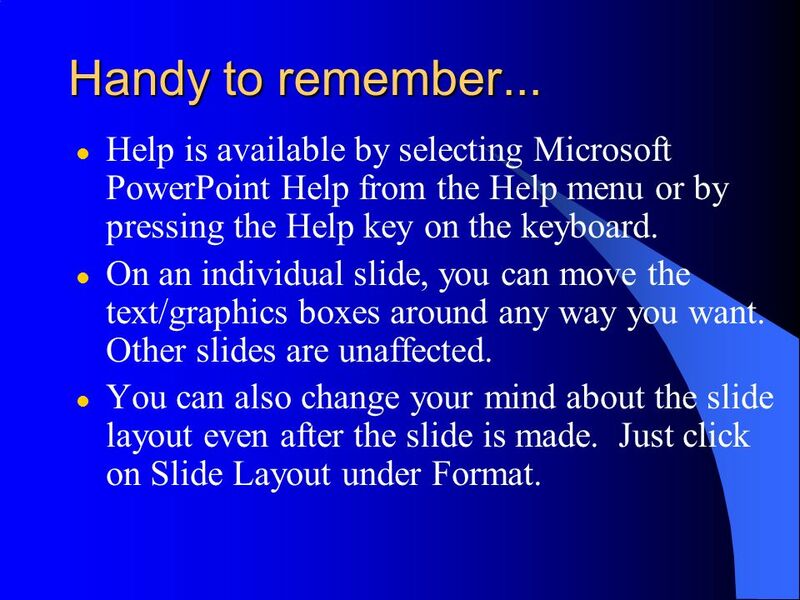 19 Handy to remember... Help is available by selecting Microsoft PowerPoint Help from the Help menu or by pressing the Help key on the keyboard. On an individual slide, you can move the text/graphics boxes around any way you want. 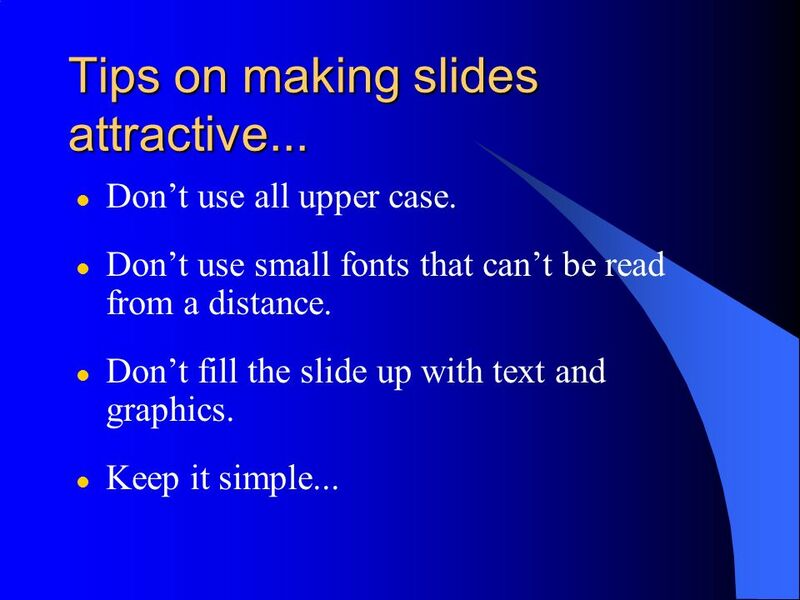 Other slides are unaffected. 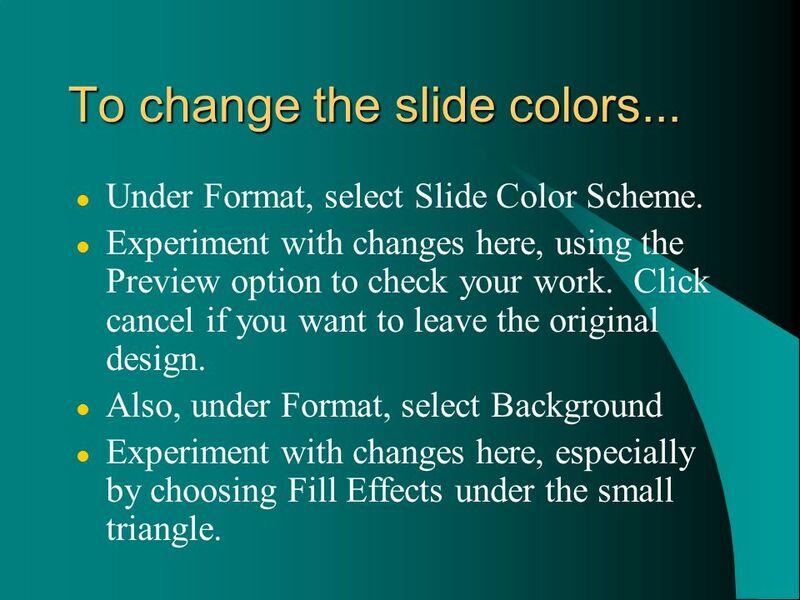 You can also change your mind about the slide layout even after the slide is made. Just click on Slide Layout under Format. If the Text box isn’t large enough for your information, you have several possibilities: Choose to put some of the text on the next slide. Highlight the text and choose a smaller font. Stretch the text box (only works for adding a little more text). Highlight the text and choose to reduce the line spacing (under Format). Under View, select Slide Sorter. 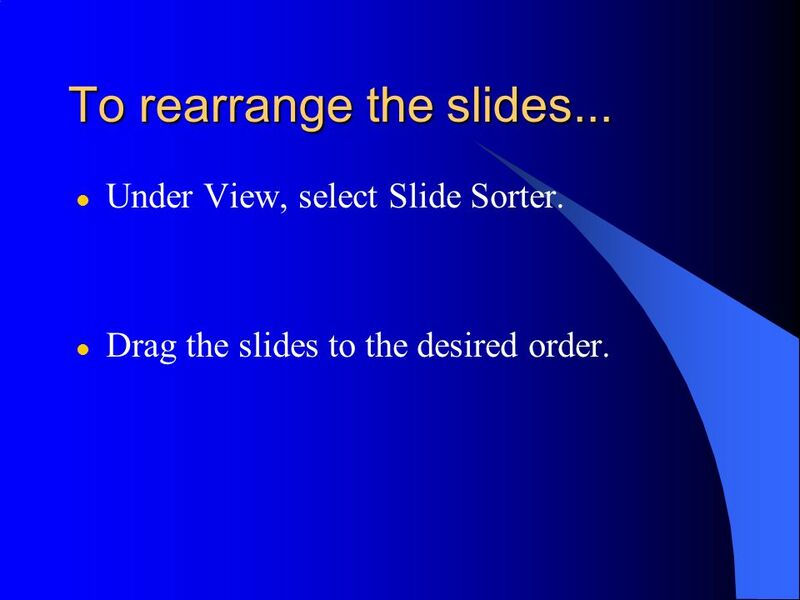 Drag the slides to the desired order. Under View, select Master then Slide Master. Change the text boxes any way you wish (size, font, alignment, etc.) 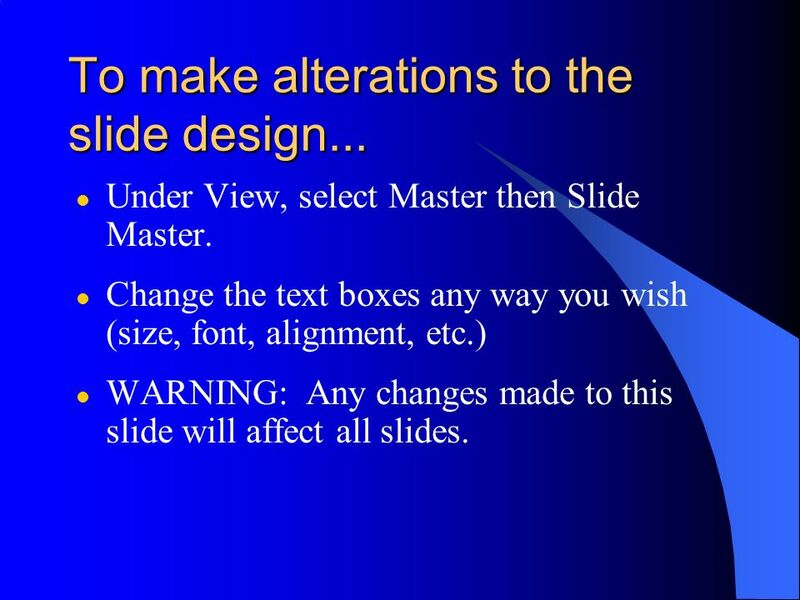 WARNING: Any changes made to this slide will affect all slides. 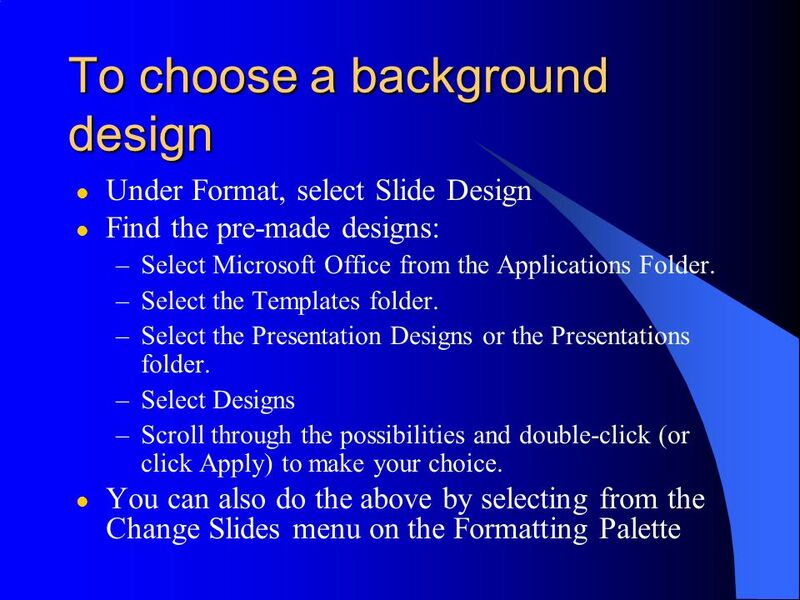 Under Format, select Slide Color Scheme. Experiment with changes here, using the Preview option to check your work. Click cancel if you want to leave the original design. Also, under Format, select Background Experiment with changes here, especially by choosing Fill Effects under the small triangle. 25 To import a picture... Under Insert, select Picture, from file. Locate your saved picture. Click insert Drag the picture to the desired location. Under General, select Microsoft PowerPoint. Under Print What: select what you desire to be printed. Highlight the text you wish to have balanced. Under Format, select Line Spacing. 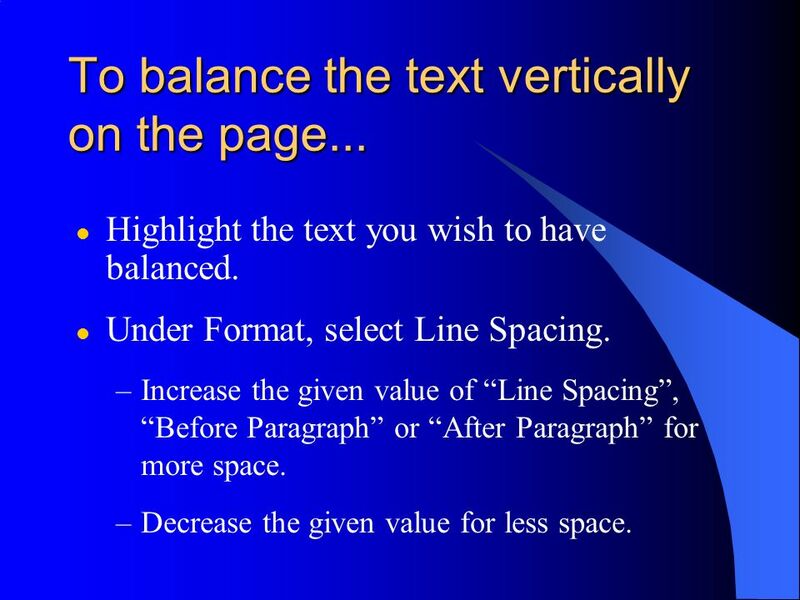 Increase the given value of “Line Spacing”, “Before Paragraph” or “After Paragraph” for more space. Decrease the given value for less space. 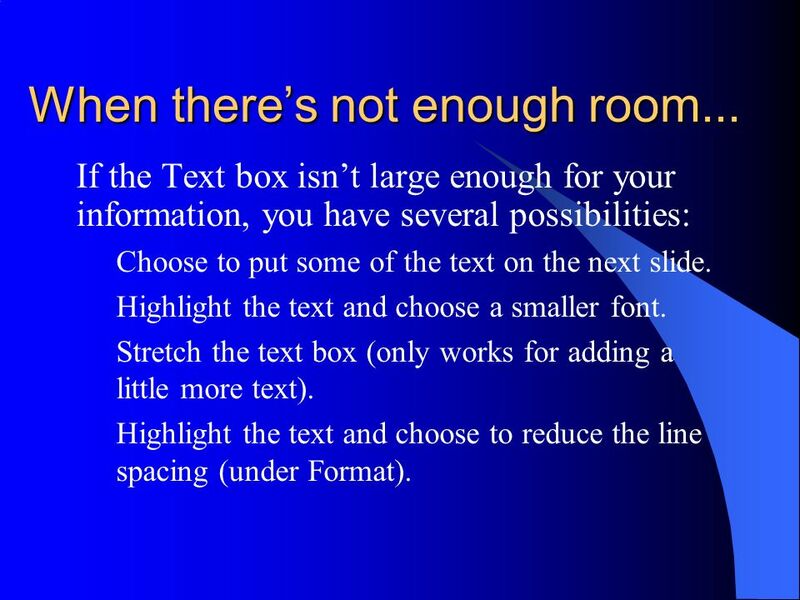 Unlike a normal word processing file, a PowerPoint presentation takes up much more room. 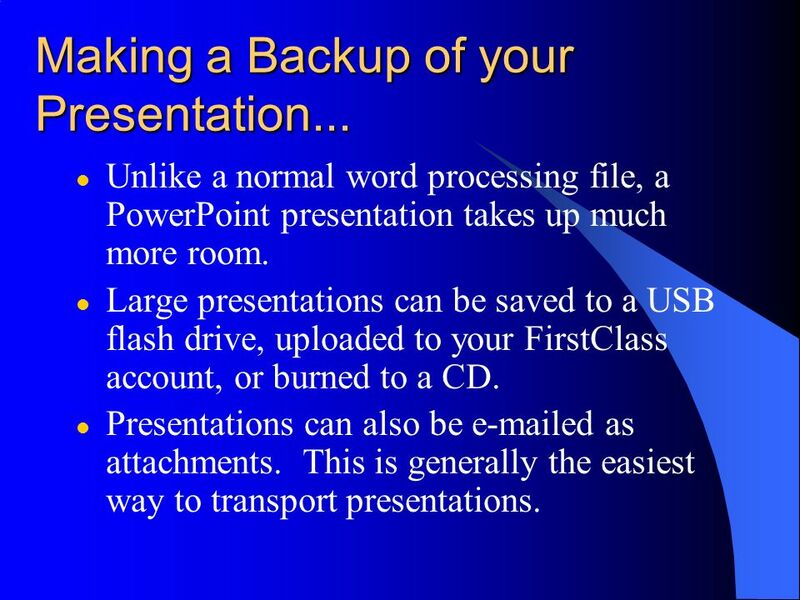 Large presentations can be saved to a USB flash drive, uploaded to your FirstClass account, or burned to a CD. Presentations can also be ed as attachments. This is generally the easiest way to transport presentations. 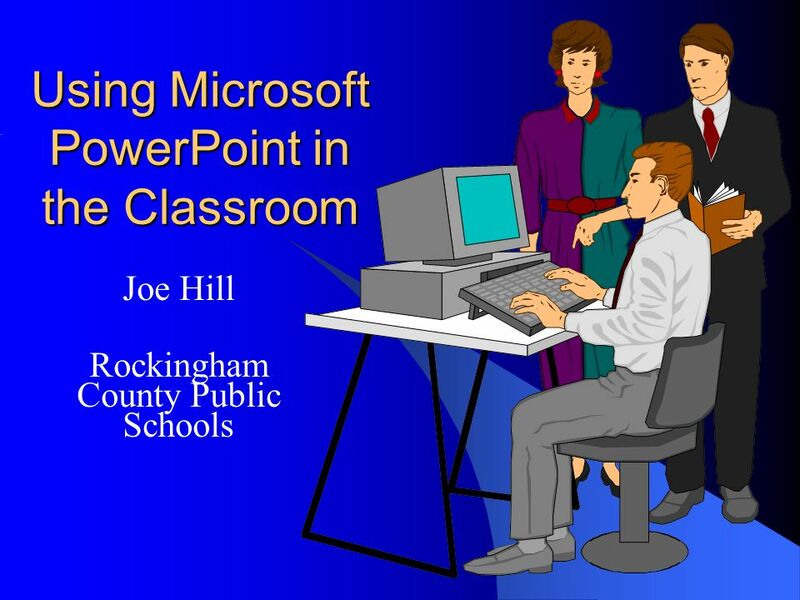 Download ppt "Using Microsoft PowerPoint in the Classroom"
Spring PowerPoint Basics Why is it a good tool to use? Easier than 3 X 5 Note Cards Organized presentations are “heard” better. 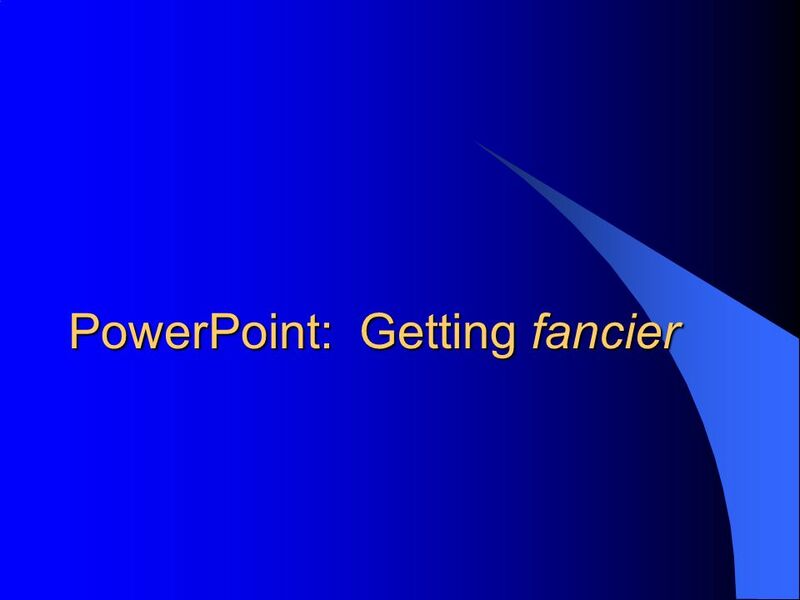 FIRST COURSE PowerPoint. XP New Perspectives on Microsoft Office 2007: Windows XP Edition2 What Is PowerPoint? 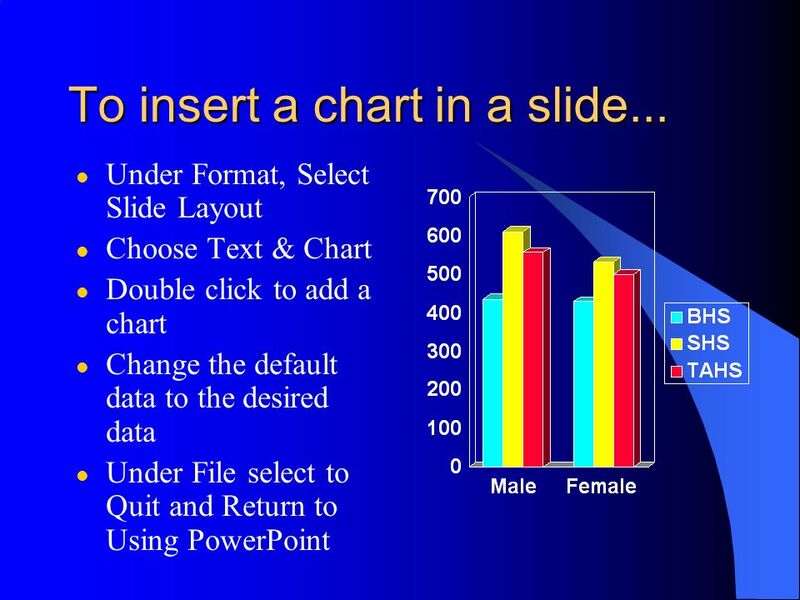 PowerPoint is a powerful presentation graphics. 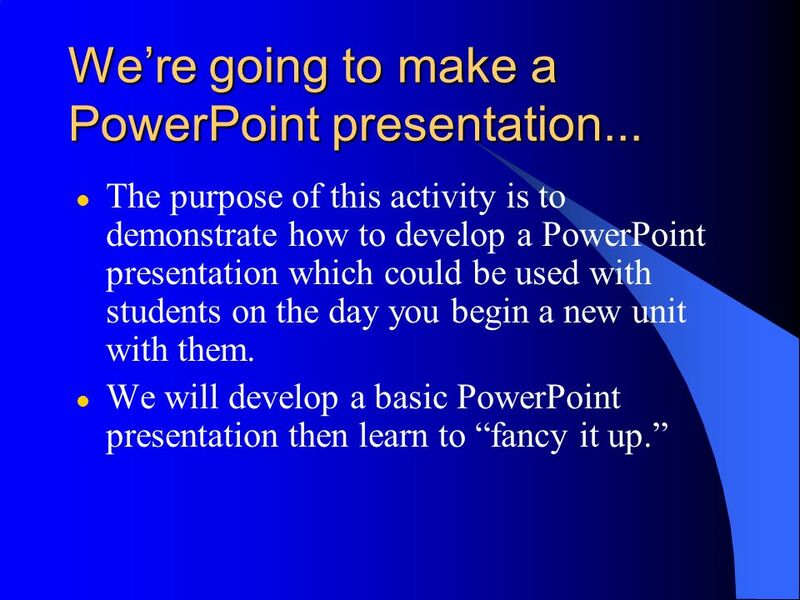 Power Point EDU 271 Microsoft PowerPoint is a powerful tool to create professional looking presentations and slide shows. PowerPoint allows you to construct. Power Point Review View as slide show to see animations.